Spending May: A To-Do List for Adventuring Through the Month. | The girl who loved to write about life. 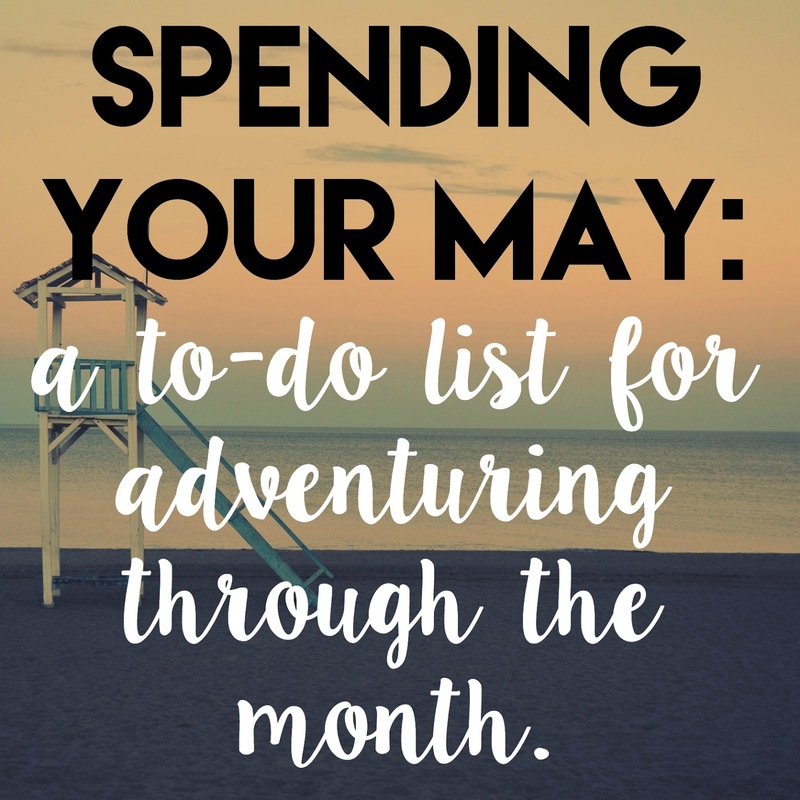 Spending May: A To-Do List for Adventuring Through the Month. 2. Call in sick and go to the beach. Or the pool, or a park. 3. Make your summer reading list. I've got some suggestions. 4. Go for a walk and take pictures of things in your neighborhood. Sometimes when you see something every day, you can forget how beautiful it is. 5. Celebrate Cinco de Mayo. Tacos and queso and guac, oh my. 6. Start a new show on Netflix. 7. Find a hammock (or at least a really comfortable chair) and spend the day reading. 8. Have a movie night where you only watch movies that you actually own. Because there was a day before Red Box when you actually purchased movies. 9. Get a library card. 10. Dedicate a night to a project you've been meaning to get to forever. 11. Every Monday, write down three things you're thankful for. Your week will be at least ten percent better because of this. 12. Invite your family (or friends that are family) over for dinner. 14. Make it a point to spend some time outside every day. 15. Have your own wine tasting party. It's cheaper, and you get to try wines that you know you'll like, instead of paying a bunch of money to pretend you like the wine that is literally described as having hints of pencil shavings and leather. Also, unlimited cheese. Yes. 16. Make your own ice cream. Look how adorable this ice cream maker is! 17. Plan your summer road trip. 18. Make grilled pizza. If you've never done this, I would be more than happy to share how we do it! 19. Spend more time in the sun and less time looking at a screen. 20. Bring a coworker coffee or breakfast and leave it on their desk with a note. 21. Say yes to more. Ask yourself your reasons when your first instinct is to say no: Is it because you're afraid or don't think you're good enough? If that's the case, change your answer. 22. Say no to more. Did you say yes just because you feel obligated or don't want to upset someone? If so, change your answer. Life is too short to not have any time to yourself because you gave all of yours away out of obligation. 23. Learn to cook something new. 24. Go to a theme park or a fair. If you live near a theme park, I highly suggest season passes. They're way more affordable than you might think! 25. Read these. And then write your heart out. 26. Make your own ice cream sandwiches. 27. Go see Pitch Perfect 2. 28. Find a sangria or summer cocktail recipe you really like. And save yourself a ton of money in the process. 29. Spend a day by the pool with no plans whatsoever. 30. Watch a sunset over the water. Or at least by the water. 31. Make S'mores. Nothing says summer quite like burnt marshmallows. i love this! And I love your list of netflix recs! now I'm craving s'mores! Awesome list! I may have to do a couple of these. These are lovely! I will be sure to add some to the summer fun list! Great list! I started a daily gratitude journal 2 months ago and it has really changed my every day outlook! I LOVE these! Mini golf needs to happen stat! This is such a fun list! Theres nothing like a round of mini golf and s'mores by the fire to start summer off right! I am currently searching for a hammock for my back porch area at my new apartment. I need a place to lay in the sun and read (and journal). Oh my gosh this morning I was totally wishing I had a back porch set up like the one I envisioned Avery having in her beach cottage/bungalow when I read your book and then I also wished I had a beach cottage. this is a great list! i hope you call in sick for a fun day soooooon! also getting a library card was so magical for me! Always love when you do these! I absolutely loved the pieces of advice in the Buzzfeed writing article, thanks for sharing!! Love the list! Love the book recommendations. I think I'm inspired with your list, lol, I should sometime go away with my usual doings. Grilled pizza? I need to try that! Yes to celebrating cinco de mayo--I started early (whoops!). And I need to make s'mores! I saw a recipe the other day (yes, a recipe for s'mores), but it has me craving one SO badly! This is such a fun list! these ideas are wonderful :) i definitely want to have a bonfire and plan a road trip. oh, and make homemade ice cream! A grilled pizza?? I can't think of anything better. Please share! Why the Library Should be Your New Best Friend. it's a beautiful day to be thankful. YA Books You Need to Read This Summer. At One Point, Your Favorite Book Did Not Exist. just write: never said hello.